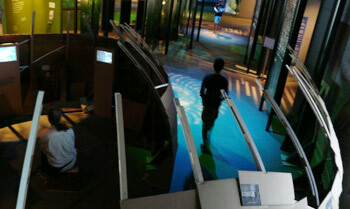 In the SCANZ 3rd Nature exhibition, Puke Ariki, New Plymouth, Taranaki, Aotearoa | New Zealand. 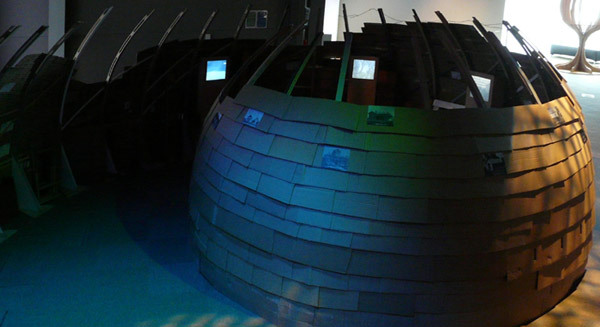 A site-specific installation made out of recycled wood and cardboard incorporating five videos with sounds in spiral form approximately 6 metres square. Videos have differing lengths so any time you are inside is a presentation of a unique combination of sound and image. A system, even an integrated system, is not a seamless continuum: what makes it a system is that it consists of distinct interrelated parts. A culture - a symbol system - is one integrated system. The human person too is an integrated system (memory, hopes, relationships, reason and spirituality), and so is an individual biography. A person, seen as a system, is the microcosm to the natural world's macrocosm, which contains elemental systems - of water, wind and earth, and of the biosphere. 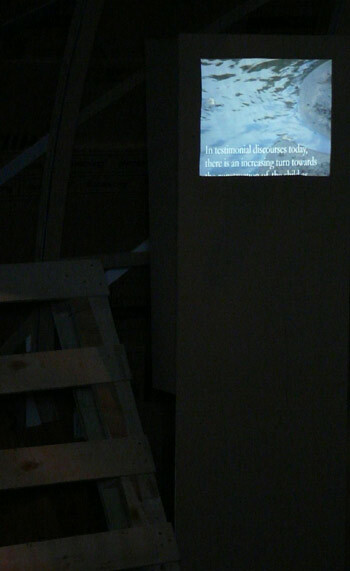 Kāinga a roto (Home Within) is an art-system, consisting of five distinct videos, soundscapes, music, lighting and shadows, and a physical space where visitors sit or lie close to the ground. 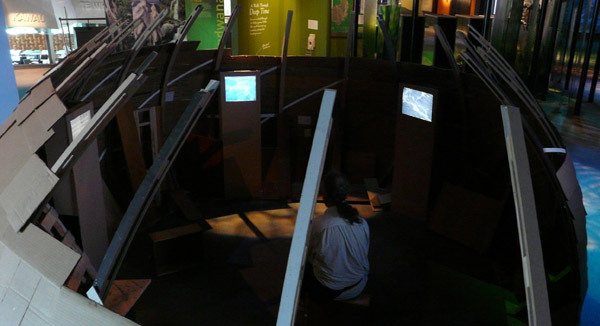 This art-system is used to represent the complex system of a particular biography (a childhood in Taranaki), using a visual language composed of references to the natural world (water in particular, but also earth, wind and bird life) influenced by New Zealand Colonial and Maori cultural values. New Plymouth home, 1960; New Plymouth home, 1900. Detail with a still from midway in the video, "The Dark Valley." Each of the physical spaces as been built specifically in response to the location of the exhibition space as well as using materials from the local environment. 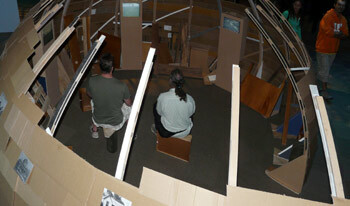 For the 2010 "Unwanted Land" exhibition in the Hague, this was in the form of a house-whare-boat form you entered into. 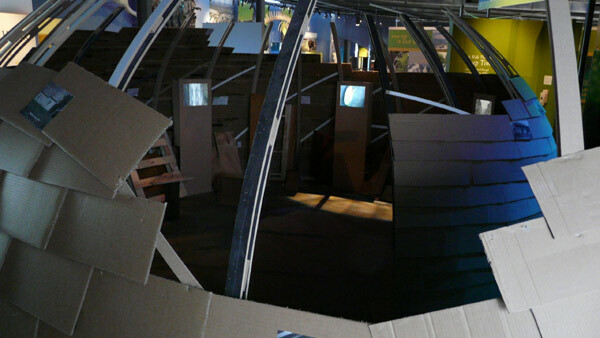 For the 2011 "Second Nature" exhibition in Istanbul, visitors entered an igloo-like arched space and for this work, museum requirements meant it was not possible to have a roof so in response the 'house' form was changed to a spiral. The 26 arches were made from MDF recycled from the Govett-Brewster Gallery in the New Plymouth polytechnic wood workshop during the SCANZ residency, and the cardboard was collected from a construction site at the polytechnic. The wood arranged inside were the remains of recycled materials from an art residency in Rotorua (see: sensonja.wordpress.com about this Dec 2012-Jan 2013 residency). Each video is in itself a system of allusions and symbols, relating the personal to the environmental, cultural and cosmic systems. 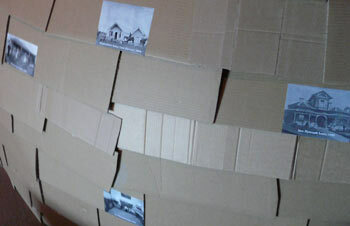 To complement these inner worlds of the individual the outer wall was covered with an arrangement of photographs of Taranaki homes from the Puke Ariki archives. The artists 'recycle' these photographs to transpose recognizable lived in spaces into an artistic statement about Taranaki 'home' dwellings which complement the way the materials - wood and cardboard - have been recycled to create a new 'kainga,' - a home away from home: "Kāinga a roto, Kāinga a roto" (Home within, home from outside) - Puke Ariki. This display of archived 'homes' also correlates with some of the questions posed by the videos: �what is a home?� and "where is a home?" This suite of videos also weaves between various worlds - the world of Tāne (the forest and the land), the world of Tāwhirimatea (the winds) represented by sounds of breathing and signs of the wind (such as in the flags filmed at the 2010 Parihaka Peace Festival), patterns on the surface of water, and a storm. In "The Moving Heart" (2nd video), the world of Rangi (the heavens) is referred to through Toroa Pohatu's lyrics about the celestial bodies inspiring us and providing literal and metaphorical illumination. In the Māori language, the title of the song: "Whānau Mārama" refers to the family of the stars as well as to an enlightened or wise family. The imagery of gliding albatross, manaia (bird-human figures) and taniwha (water-spirits) and Sonja's koru-filled iron sculpture harmonise with this gliding between realms: the familial and the celestial. A similar switching between the personal and the external occurs in "The Dark Valley" (3rd video) in the use of text, while in The Two Lands (4th video) the timing and visuals is what gives distance to a personal narrative. Birds can be heard in all of the videos, beings which live on the land, in the air and on the water. In The Dark Valley the rooster strutting on the beach seems out of place, an import, while in The Tears of Rangi the pukeko (native hen) steps with care, and in The Two Lands, crows scatter outwards. Birds are heard sometimes as part of the natural world and at other times as part of a soundscape. However the world which dominates in all the videos is that of Tangaroa (the seas and rivers). Because water doesn't stand still, we are carried along, by the flow, the sounds, and by a narrative that is sometimes personal and traumatic - at other times juxtaposed with theoretical text. Childhood is a recurrent theme in these videos. It is associated with inner or metaphysical movement, detachment and change. Ehara taku kāinga i te kāinga tu tonu. He kāinga nekeneke. My home is not a home that stands still. It is a home on the move. Kāinga a roto | Home within, 2011, Istanbul, Turkey.